I would like to invite everyone to check out MG Precision Arms LTD; a local Ohio based company I have started with a close friend. We offer the latest technology in Titanium Nitride coatings and refinishing as well as other customizing services. For those not familiar with Titanium Nitride it is unique in terms of firearm finishes as it not only gives a custom look to your firearm it also adds durability and reduces the friction on the coated part. This allows you to run your firearm with less oil/lube, vastly increases the durability, and makes cleaning much easier. Another plus with Titanium Nitride is the average coating only adds 3 micrometers of material, so it will not change the function of your firearm only enhance the look of it. It is applied in a cathodic arc chamber which ensures a uniform coating. This is the same coating that is used by high speed cutting tools to give you an idea of its strength. 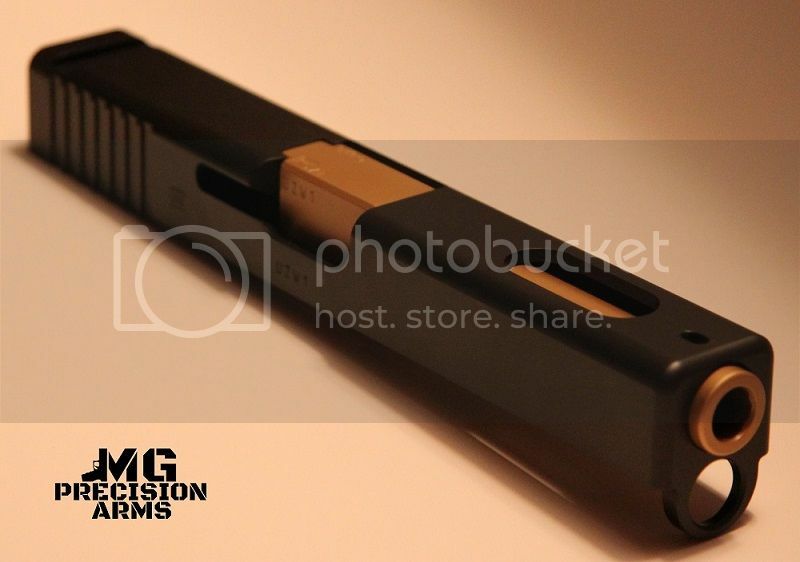 MG Precision Arms LTD separates our business by offering not only one finish option, but 4. We also pride ourselves on a quick turn around. We understand that most will be using these coatings on firearms they rely on, and we do everything we can to return your part as fast as possible. While other companies offer 4-6 week returns, we have a 2-3 week turn around, and often return parts even quicker. If you are looking for the most durable coating with plenty of finish options, a good price and fast turnaround MG Precision Arms LTD is the company to use. Pricing for the Titanium Nitride is shown below. Please note that also included in the pricing is cleaning and blasting which occurs prior to coating. For ease of transaction we prefer that you dis-assemble your part to the best of your ability prior to shipping. If that is not something you are comfortable with, we will gladly assist. Shipping - $8 regardless of order size. Tracking included. -We are also awaiting our 01/07 licenses and look forward to offering the manufacturing of suppressors and other registered items in the near future. If you have some custom work you would like done and do not see it on the list, please do not hesitate to contact us. Also, take a minute to like our Facebook page and get a chance to win some free services! Thank you for taking the time to read about us and we look forward to assisting you with your firearm needs. Nice! Congrats on the new business. Hope to send some stuff your way in the coming days ! I have a 1911 frame and slide that I need done. Are you able to do the frame if I hand deliver it? 4pocalypse wrote: I have a 1911 frame and slide that I need done. Are you able to do the frame if I hand deliver it? Not at this point. The slide wouldn't be a problem, but the frame will have to wait. And due to the heat generated from the coating, we don't do aluminum with the Titanium Nitride. Thanks for the questions! Also every hundred likes we are giving away a $75 gift certificate. Take a minute to check us out if you haven't. Thanks! Some recently completed customer parts. We are now an 07 FFL, and will be starting to manufacture suppressors and other items in July when we pay the SOT. We currently offer full gunsmithing, machining and transfers ($20). If you have any questions please let me know. Look us up here: https://www.facebook.com/MGPrecisionArms or you can pm me for contact information. Thanks! Glock23 wrote: We are now an 07 FFL, and will be starting to manufacture suppressors and other items in July when we pay the SOT. We currently offer full gunsmithing, machining and transfers ($20). If you have any questions please let me know. Look us up here: https://www.facebook.com/MGPrecisionArms or you can pm me for contact information. Thanks! Any chance you cut, crown and thread barrels? Never mind, saw from your fb page that you do. These guys do great work! MG precision did a barrel for me. It was well done and fast turnaround! Machine guns are better than any drug in the world.